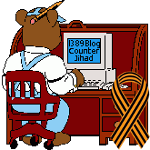 Emergency Fundraiser For Blogger Blazing Cat Fur, Monday, Jan. 7, 2013 Toronto Zionist Center — 1389 Blog - Counterjihad! Radical Muslims are attempting to shut down Blazing Cat Fur. I am not sure what you are talking about. I don’t see any fight scene here. Did you post your comment on the wrong blog?